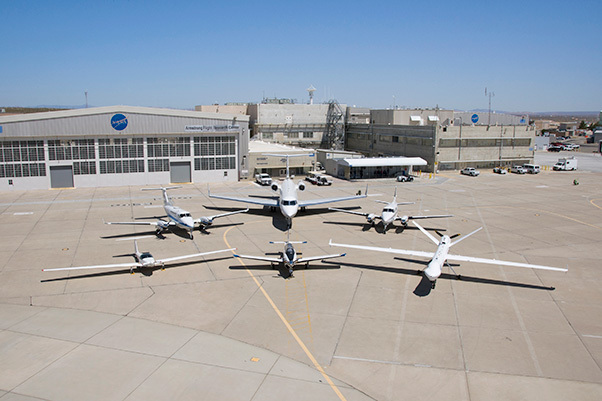 The aircraft used in the Unmanned Aircraft Systems Integration in the National Airspace System project include, front from left, a TG-14, a T-34C and the Ikhana remotely piloted aircraft. The back row from left include a B-200, a G-III and a C-90. A NASA Social highlighted two projects, one with supersonic aircraft and the other featuring subsonic aircraft and a remotely piloted airplane, May 31 at NASA’s Armstrong Flight Research Center in California. 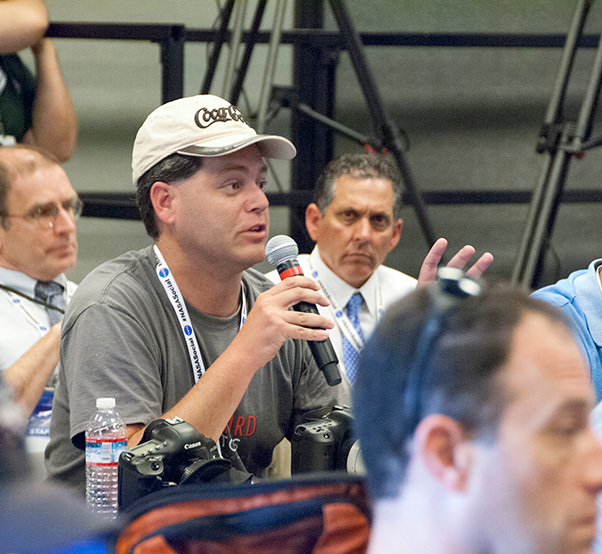 About 45 social media representatives and a number of media organizations listened to updates on NASA’s work to mitigate the sound made by aircraft traveling supersonically. The other topic was how aircraft are helping to validate technologies that could lead to Unmanned Aircraft Systems Integration (UAS) into the National Airspace System (NAS). Dave Richwine, NASA Commercial Supersonic Technology subproject manager based at NASA’s Langley Research Center in Virginia, said the U.S. needs to “make sure it is out front” in supersonic aircraft. Supersonic aircraft could reduce travel times by half and infuse the economy with good jobs and open new markets. A three-pronged strategy is progressing. The approach includes a sonic boom simulation lab at NASA Langley, shaped sonic boom research in restricted airspace at Armstrong and data collection with a proposed supersonic demonstrator called the Quiet Supersonic Technology. Tom Jones, NASA Commercial Supersonic Technology associate project manager based at Armstrong, explains components of NASA’s supersonic research including the proposed Quiet Supersonic Technology demonstrator illustrated in the background, which is currently under design by Lockheed Martin. The strategy could provide the information needed to make recommendations to the Federal Aviation Administration for amending a prohibition in place since the 1970s on over land supersonic travel. The idea is to reduce the strength of the sonic booms and break them up so the sound is hardly noticeable by people on the ground, Jones explained. The QueSST is being designed through a NASA contract with Lockheed Martin. Michael Buonanno, Lockheed Martin chief engineer for the QueSST contract, said the design includes a 94.2-foot long, piloted aircraft with a single engine. The concept includes many commercially-available systems to reduce cost of the potential future X-plane that would greatly reduce the sound of current breaches of the sound barrier. 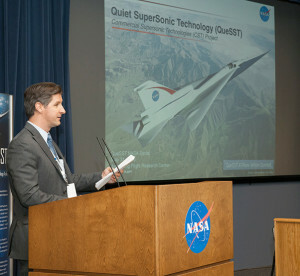 Attendees heard sonic booms from a NASA F/A-18 supersonic aircraft in level flight as well as witnessed demonstrations of a special flight technique that mimics the magnitude of the much quieter sonic booms that the QueSST aircraft is being designed to achieve in level flight. Philip Belzeski, a Boise State University physics major who is popular on Twitter for his music, said he has worked with astronauts and wants to be one in the future. He heard his first sonic boom. Laurie Grindle, NASA Unmanned Aircraft Systems Integration in the National Airspace System project manager, explains how the project is validating technologies that could lead to UAS eventually flying in the same airspace as human piloted aircraft. A panel including Richwine, Jones, Peter Iosifidis, Lockheed Martin program manager for the QueSST contract, and NASA Armstrong aerospace engineer Ed Hearing and NASA Armstrong pilot Jim Less, answered questions about supersonic aircraft and various schlieren processes, which capture images of the air density changes around aircraft as it travels supersonically. Britt Dietz, who is popular on Facebook for his aviation photography, said he was fascinated by the use of filters and the sun to produce stunning images. The second part of the NASA Social focused on UAS Integration in the NAS (UAS-NAS) with a presentation by Laurie Grindle, NASA UAS-NAS project manager, and Sam Kim, NASA UAS-NAS integrated test and evaluation project engineer for Armstrong. To complete the work needed for UAS integration, all four aeronautics centers including Ames Research Center in California, Armstrong, Glenn Research Center in Ohio and NASA Langley are tackling aspects of the challenge to reduce technology barriers to UAS integration in the NAS. The goal is ultimately to have routine National Airspace System access for UAVs. Procedures and standards and infrastructure tests to evaluate those standards are part of that effort. For example, a Federal Aviation Administration regulation includes a provision that a UAS have the capability to see and avoid other aircraft. To meet that goal, UAS industry partners developed a sense and avoid technology to assist a remote pilot to maintain a safe separation from other air traffic. NASA’s remotely piloted Ikhana is validating sensors that detect other aircraft from further distances. Other aircraft with similar systems are called cooperative aircraft in the simulations. Aircraft that do not have such systems, like general aviation aircraft, are considered non-cooperative aircraft and Ikhana uses radar to detect those aircraft. Command and control allows a pilot to fly with a radio and support infrastructure to facilitate a move from one tower to another. Britt Dietz, who is popular on Facebook for his aviation photography, asks a question at a NASA Social at NASA Armstrong Flight Research Center in California. Human factors allow for design of ground displays that serve as the interface of sense and avoid and command and control. These displays provide the pilot information such as traffic alerts that allow the pilot to remain clear of congested areas. Live distributed systems allow virtual aircraft to interact, so pilots can work with many “intruder” aircraft safely. The UAS Integration into the NAS project is expected to continue looking at solutions to remaining challenges, potentially through 2020, Grindle said. Grindle, Kim and Debra Randall, NASA UAS-NAS chief systems engineer, and Hernan Posada, UAS-NAS pilot, sat on a panel to answer questions attendees had about that project. Participants asked about cyber security. Panel members said security is included in the standards and what kind of protection a data link requires. Researchers work closely with Federal Aviation Administration on what the minimum standards should be. Another question was what happens if the Ikhana loses communication with the ground control station. In that case, Posada said, Ikhana is programed to return home, where it is based. Attendees were able to see supersonic aircraft such as a NASA F/A-18 used in the supersonic flight earlier in the day, and the Ikhana remotely piloted aircraft that is a part of the UAS in the NAS work at Armstrong. 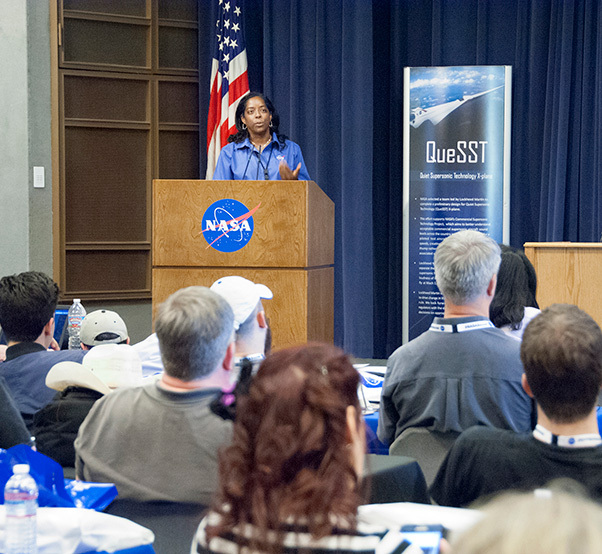 Attendees of the NASA Social learned about aspects of supersonic flight and UAS systems. Regardless of how fast or slow an aircraft flies, NASA researchers are working on it. 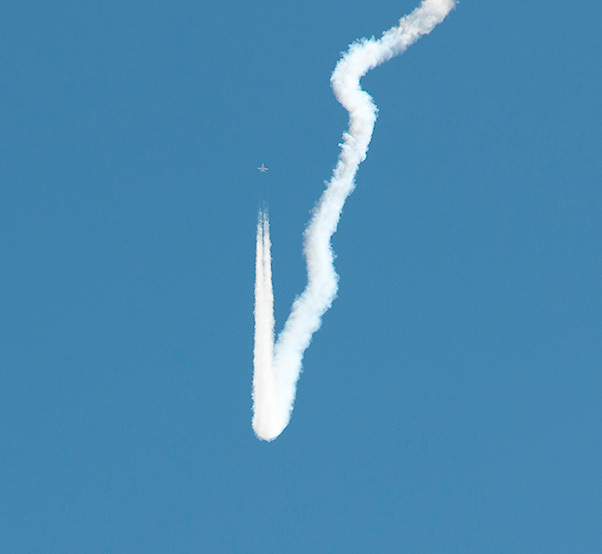 A NASA F/A-18 demonstrates different volumes of sonic booms for attendees of a NASA Social at the NASA Armstrong Flight Research Center in California.